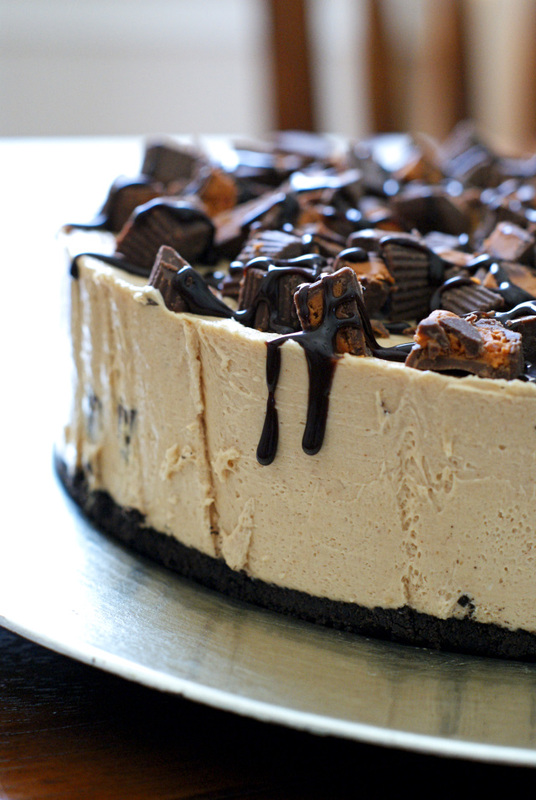 This Peanut Butter Cup Overload No-Bake Cheesecake is for serious peanut butter lovers only! Loaded with creamy peanut butter and peanut butter cups, this simple no-bake cheesecake is a peanut butter lover's dream! I'm on Pinterest pretty much all the time. I love, love, love it. Pinterest is full of inspiration for recipes, party ideas, beauty tips, cleaning and organizing hacks, and virtually anything and everything else you could possibly think of. Sure, I could use google to get all of the same ideas, but because I'm a visually driven person, the image pinboard format of Pinterest totally speaks to me. I look like a pretty motivated person with all of the things I pin. You, too, right? When I click pin it, I'm totally going to be sewing oversized t-shirts into cute little dresses, whipping up DIY carpet cleaner, and I'm 100% for sure making indulgent, decadent, dreamy, over the top desserts. Truth is, I, like most others out there browsing Pinterest, am usually not following through with 99.9% of those awesome pinned ideas. Sad, but true. This cheesecake here? This is the kind of dessert recipe that I am forever pinning and never making. Seriously, just look at my pin boards. The Desserts & Sweets board has tooooons of pins, but I've probably made like two of them. I just can't help it, though. I see triple chocolate, peanut buttery, gooey, caramel-y anything, and I'm pinning it. The funny thing is, I really don't even eat sweets too often. I just don't crave them. My pin boards tell me otherwise, though, so I figured it was high time I make one of the fabulous desserts I find myself pinning over and over again! Now, one of the reasons I almost never make the sweets that I pin is because, aside from not craving them all that often, I don't need a whole pie, or a whole cake, or 3 dozen cookies. 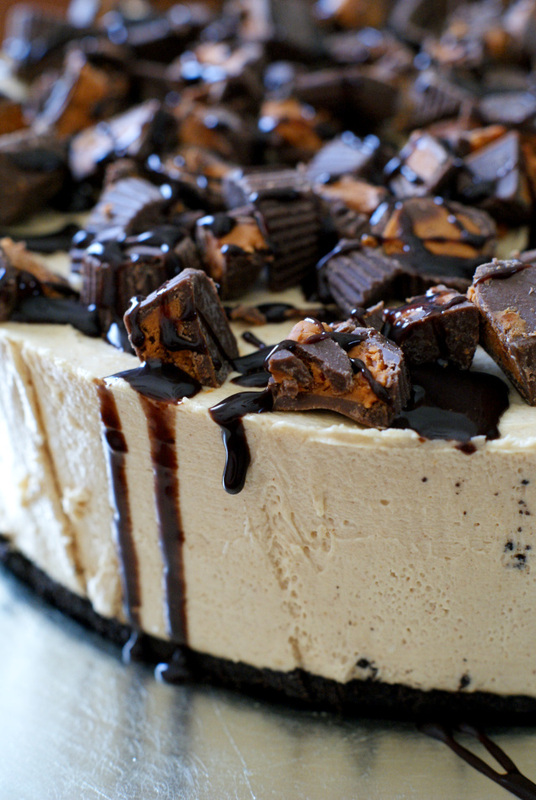 I mean come on, do I really need to be eating an entire peanut butter cup overload cheesecake? Luckily, I was presented with the perfect opportunity to go all out and make a delicious, decadent dessert for a crowd, which is what this cheesecake is perfect for! I was asked to make the desserts for my little sister's bachelorette party! I made chocolate covered strawberries and this gorgeous, rich, no-bake cheesecake. That's right, this beauty is no-bake. 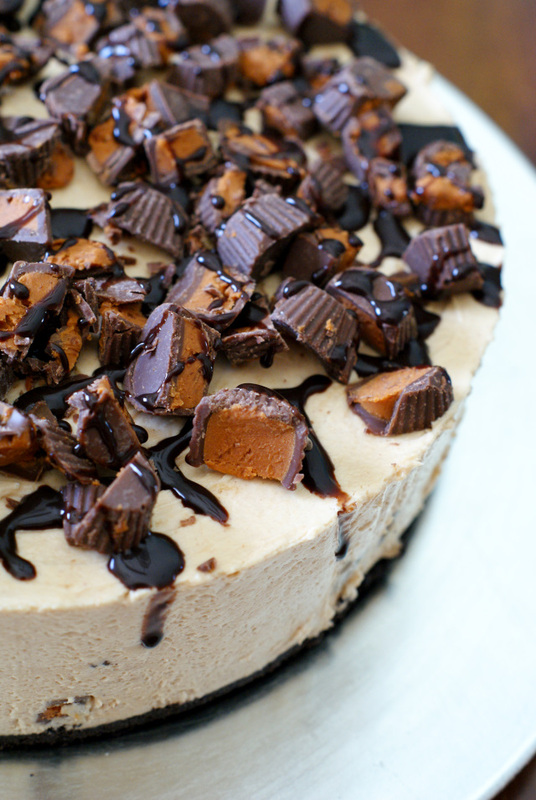 You simply mix everything up, pop it in the fridge, and a few hours later you're in peanut butter cup heaven! With an Oreo cookie crust and sweet peanut butter cups in every bite, this silky no-bake cheesecake is simply irresistible! You'll never believe how easy it is to make. 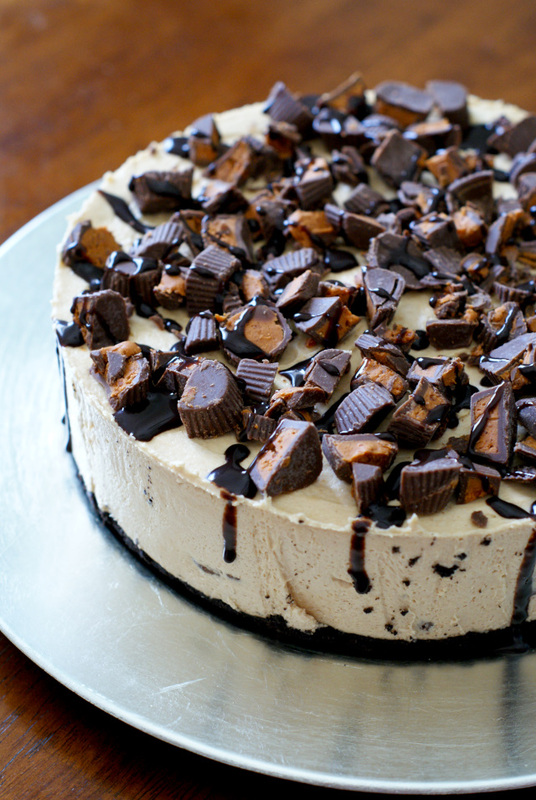 If you've got a party coming up and you looooove peanut butter, you have to try this cheesecake! Put the quartered peanut butter cups in the freezer for 30 minutes to harden. Process Oreos in your food processor, add melted the melted butter, and continue processing to combine. Line the bottom of your springform pan with parchment paper. Press the mixture evenly into the pan. Refrigerate crust for at least 30 minutes. In a stand mixer, beat the cream cheese, peanut butter, powdered sugar, and vanilla until well mixed. Fold in the whipped topping until completely combined. Fold in half of frozen peanut butter cups. Spoon the mixture into the springform pan and smooth with a rubber spatula. Refrigerate for at least 5 hours. Run a knife around the inside edge of the springform pan and then release. Slide the cheesecake onto a serving platter, removing the parchment paper. Top with remaining peanut butter cups and drizzle with chocolate sauce right before serving. For the cheesecake pictured, I used miniature Butterfinger peanut butter cups because my store was out of Reese's miniatures. Either will work well with this recipe! My Mom suggested trying this cheesecake frozen, which sounds super yum. I might try it that way next time! It was absolutely decadent and scrumptious!